BunkHaus Boutique Hostel v Saint John New Brunswick, Kanada: Zarezervujte nyní! BunkHaus Boutique Hostel is your home away from home. 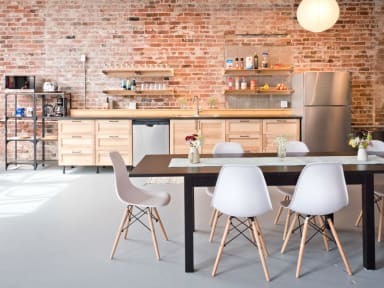 We feature free WiFi along with a communal kitchen complete with dishwasher, fridge, microwave, and small appliances. A large dining room table is the focal point of our main room and is complemented by a breakfast bar and lounge area overlooking Water Street. 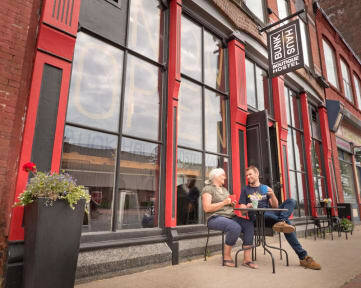 Located on the Bay of Fundy and in the heart of Uptown Saint John, BunkHaus is next door to an incredible microbrewery and is just steps away from the best bars, restaurants, and music venues. Looking for something low-key? We're surrounded by beautiful old brick buildings lining the streets that lead to nearby parks, beaches, and the oldest city market in Canada. We are also proud to offer a co-ed dorm room, three private bunk rooms, and two private double rooms where each guest will benefit from sleeping on a brand new Canadian-made Hamuq mattress complete with soft, hypoallergenic bedding. We've also installed a brand new ventilation system to keep fresh air pumping to each room 24/7 because we want you to wake up from one of the best sleeps of your life. Breakfast not included. Tea/Coffee are included. No 24hr reception - arrive anytime with notice but book before 10pm.